Here is a health tip to share with your family: breastfeeding could reduce risk of childhood obesity. Mothers who are diabetic can help manage their children’s weight into the future by — if nature permits — breastfeeding them as infants. Children of diabetic pregnancies have a greater risk of childhood obesity. But this new U.S. study proves that breastfeeding could reduce this threat. It tracked 94 children of diabetic mothers and 399 of non-diabetic pregnancies from birth to age 13. They evaluated the influence of breastfeeding on the growth of body mass index (BMI), an indicator of childhood obesity. Obesity is critically defined in pregnancy and early life. The study addressed children exposed to over-nutrition in the womb because of the pregnant mothers’ diabetes to see if early life nutrition could alter their risk of childhood obesity. This, of course, is the driving force that will make the obesity epidemic continue into the future. RECOMMENDED: The Little Known Fruit That Could Fight Diabetes. Children of diabetic pregnancies who were breastfed had a slower BMI growth as they grew older than those who nursed fewer for than six months. 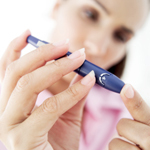 A similar pattern emerged for children of non-diabetic pregnancies. According to researchers, we know that children exposed to diabetes or obesity during gestation are at higher risk for childhood obesity and metabolic diseases. Now we know that there is a second critical opportunity to normalize BMI growth by encouraging mothers to breastfeed for at least six months. This corresponds to the time recommended by the Academy of Pediatrics. It’s a significant finding, as breastfeeding alone represents an effective way to reduce obesity in the U.S. Researchers hope that it encourages mothers to breastfeed, especially those who’ve experienced a diabetic pregnancy. They can find help with pediatricians, obstetricians, and the public health community. The rate of childhood obesity has more than tripled in the past 30 years. Obese youth are more likely to have risk factors for heart disease, one of the leading causes of death. They are also more likely to develop diabetes, bone and joint problems, sleep apnea, and low self-esteem. If obesity progresses to adulthood, their health issues are magnified enormously.